CAMBRIDGE, ONTARIO – Arriscraft, manufacturer of naturally-made products that emulate quarried stone, has expanded its natural limestone offering with Adair® Studio, featuring an elegant and unique finish. Arriscraft is the stone products group of General Shale, the North American subsidiary of Wienerberger AG and a leading manufacturer of brick, one of the world's oldest green building materials. Studio is designed for coursed installation (laying one size continuously), which is an efficient option to a classic ashlar pattern (also available). Studio features Adair's sepia tone and the Glacial finish highlights the distinct fleuri pattern and natural elements, like fossils, in the limestone. This product is available in three face rises (2-5/16", 5" and 11-5/8") at lengths of 35-5/8". 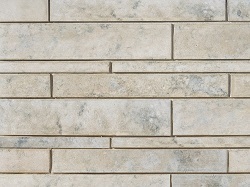 Arriscraft's Adair® Limestone is a natural, quarried stone harvested in the Georgian Bay region of Ontario. Since the 1960s, the quarry has offered Blue-Grey and Sepia tones. In addition to Studio, Arriscraft produces Adair® Masonry Units, Anchored Dimension Stone, Tile, Landscaping Stone, and Thin Adair®.